Nearly four weeks after announcing, on 7/14/11, a plan to fund new garbage cans for residents in the area around the Atlantic Yards footprint, Forest City Ratner has finally provided details, via a public notice (below) that began to circulate last night. However, some of those reporting rat problems likely will be disappointed: the area covered is limited, from Fourth to Vanderbilt Avenues, and Atlantic Avenue to Bergen Street, with a good chunk of the rectangular territory including the Atlantic Yards site itself. Nor does the area represent an evenly-drawn radius around the site--it goes south (and slightly to the east and west) but not north. I queried City Council Member Letitia James, who had conveyed complaints from Fort Greene, north of Atlantic Avenue. The "process has begun but it is still subject to change," she said, hinting that the boundaries could be expanded. The map, taken from the flyer further below, has been amended (by Atlantic Yards Watch) by shading in the Atlantic Yards site, which takes up nearly half the total area. 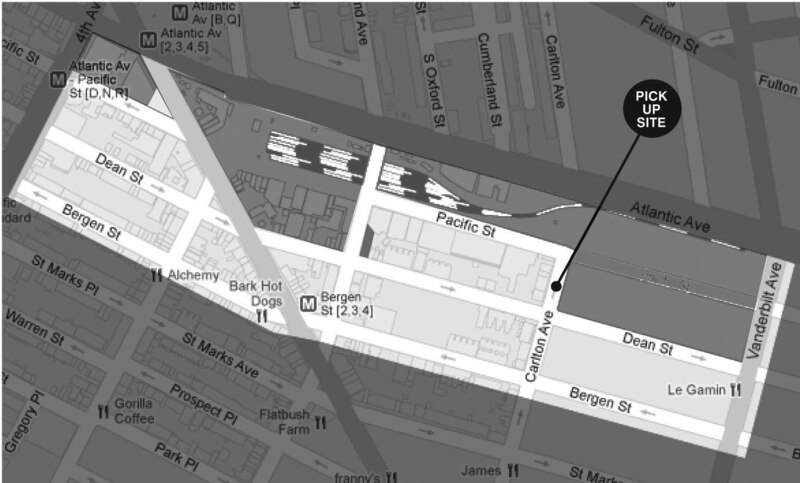 Note that official AY site map contains a larger chunk east of Sixth Avenue, between Dean and Pacific Streets, but Forest City does not yet control it, and that the Brooklyn Bear's Garden, at the tip of the western intersection of Pacific Street and Flatbush Avenue, is not part of the AY site. The garden too has experienced rat problems. Forest City Ratner in May expressed resistance to providing assistance anywhere outside the Atlantic Yards site, warning that it would lead to a cascade of requests. After bending that policy, Forest City--in consultation with the Department of Sanitation--was cautious in drawing the boundaries, going only as far as the east side of Vanderbilt Avenue, the south side of Bergen Street, the east side of Fourth Avenue, and the south side of Atlantic Avenue. That's understandable--the developer is likely wary of setting a precedent regarding the effects of arena operations, which could lead to even more extensive complaints about the impact of garbage and traffic. However, those who attended public meetings about the "rat tsunami" not only came from blocks nearest the Atlantic Yards site. Some came from Prospect Heights blocks south of Bergen Street, such as St. Marks Avenue and Prospect Place. Others came from Fort Greene, north of Atlantic Avenue. For example, one report on Atlantic Yards Watch refers to "a dramatic spike" in rat sightings at Fulton Street and South Portland Avenue. But the issue can't be solved by garbage cans alone; it require a more holistic approach, involving residents, businesses, and city agencies. An educational forum on rodent issues, hosted by Empire State Development and New York City Departments of Health and Sanitation, will be held at the Pacific Branch of the Brooklyn Public Library on Wednesday, August 17 from 6-8pm. Note that Forest City made a point of buying the cans from Pintchik Hardware, a stalwart business in the area and a huge landowner. As part of our commitment to our neighbors, Forest City Ratner Companies will provide free waste receptacles to tenants, superintendents and building owners near Atlantic Yards. Lidded, heavy-duty trash cans like those being offered by Forest City Ratner can help keep rodents away from buildings as part of a comprehensive rodent control strategy. We will provide a Department of Health-approved garbage can that Forest City Ratner Companies bought at Pintchik Hardware on Bergen Street. Cans are being offered to everyone in residential buildings with 12 or fewer units within this area: * Eligible buildings are located: south of Atlantic Avenue from 4th Avenue to Vanderbilt Avenue; Vanderbilt Avenue from Atlantic Avenue to Bergen Street; Bergen Street from Vanderbilt to 4th Avenue; 4th Avenue (East side only) from Bergen Street to Atlantic Ave.
For more information on how to prevent rodents, please attend an educational forum hosted by Empire State Development and New York City Departments of Health and Sanitation at the Pacific Branch of the Brooklyn Public Library on Wednesday, August 17 from 6-8pm. Experts will offer strategies for rodent prevention and answer questions. Make sure your building is located within the boundaries and has 12 units or fewer. At pick-up, provide photo ID and proof of address by showing a utility bill with your unit number dated within the last three months.